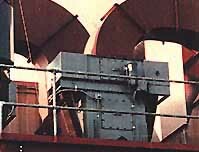 American Environmental International, Inc. (AEI)200-F automatic indexing travelling bed filter has been developed to remove submicron size particulate, aerosols and odors from a variety of industrial exhaust applications. This filter is suitable for the control of oily, odorous, and corrosive contaminants and smoke present in process exhaust streams. It is designed to automatically index a portion of new filter material into the exhaust inlet chamber. The indexing is controlled by automatic instrumentation that continuously monitors the condition of the filter. An electric motor is periodically energized on demand to move a new portion of filter media into position. The filter rills are available in 30-ft, 100-ft or 500-ft lengths.